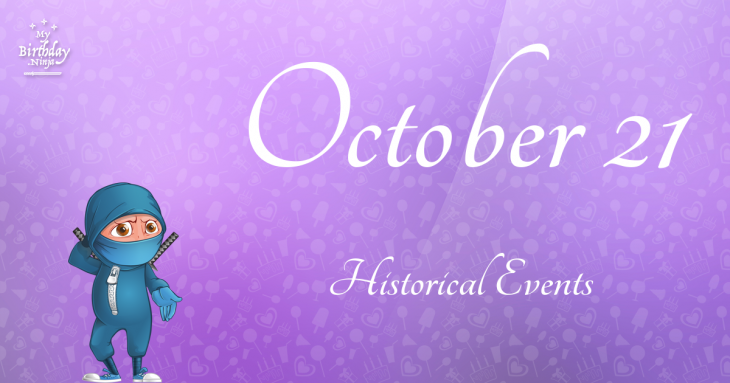 The following events took place on October 21. The list is arranged in chronological order. Found 55 events. Showing 1 - 30. Nanboku-chō, Japan: Emperor Go-Kameyama abdicates in favor of rival claimant Go-Komatsu. First display of the word “Liberty” on a flag, raised by colonists in Taunton, Massachusetts in defiance of British rule in Colonial America. In Boston Harbor, the 44-gun United States Navy frigate USS Constitution is launched. Florence Nightingale and a staff of 38 nurses are sent to the Crimean War. Opening ceremonies for the World’s Columbian Exposition are held in Chicago, though because construction was behind schedule, the exposition did not open until May 1, 1893. In the United States, a five-month strike by United Mine Workers ends. President Warren G. Harding delivers the first speech by a sitting U.S. President against lynching in the deep South. George Melford’s silent film, The Sheik, starring Rudolph Valentino, premiers. The Sakurakai, a secret society in the Imperial Japanese Army, launches an abortive coup d'état attempt. World War II: The first kamikaze attack. A Japanese fighter plane carrying a 200 kg bomb attacks HMAS Australia off Leyte Island, as the Battle of Leyte Gulf began.